Stepping out and taking what is yours in life is necessary so that you may live the greatest life you may possibly live. 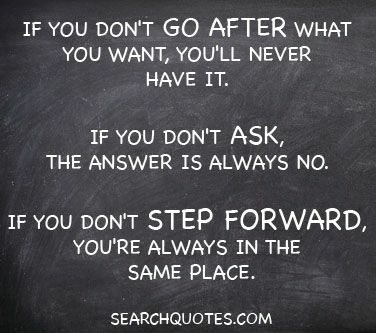 If you never take chances, and if you are never willing to go after what you want, you will never have it. If you are never willing to ask for anything in life, the answer will always be no, and you will never have all of the tools that you need to become the greatest you. If you aren't willing to take steps and progress forward in life, you will always be in the same place, and gaining new strength and growth will be two things that will be hard to come by. Be that courageous soul, and live the life that you are destined to live. Not only do we have to dream big, but also we must believe with great faith, and take both small steps and giant steps towards becoming the people we want to become.